Coming up this weekend there are quite a few fall festivals at the shore. Wildwood is a busy town, first with the Seafood and Music Festival on Saturday, a free street fair on Atlantic Ave. between Wildwood and Schellenger Avenues. Live music, crafters, food vendors, Kidz Korner, pie eating contest and more. Then on Sunday it’s the Closing Day Celebration at Morey’s Pier, a traditional farewell to summer. Special lineup of games, prizes and entertainment with reduced prices on amusement ride wristbands. The Cape May Wine Festival takes place Saturday and Sunday, from noon to 5pm at the Ferry Terminal. Take advantage of the warm autumnal weather to sample the award-winning wines of New Jersey, listen to two live bands, stroll through crafters and visit The Kids Zone which has activities especially for the younger attendees. Twenty-three New Jersey wineries will be offering nearly 300 locally produced wines for sampling, all for just $20 a person. Among their offerings will be more than 50 wines that have won more than 80 awards this year at international wine competition including California’s and New York’s top events. Seaside Heights will host the Italian Street Festival, a weekend of Italian specialties, arts and crafts, entertainment. It will culminate on Sunday with the 19th Annual Columbus Day Parade at 1 pm, featuring bands, floats, mummers and surprises on the Boulevard. 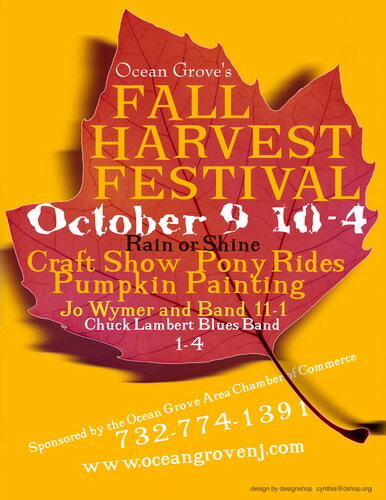 Saturday there’s the Fall Harvest Festival and Craft Show in Ocean Grove, with over 90 arts & crafts vendors, sidewalk sales, pony rides, live music, and a variety of foods. Sunday you can go to the Belmar Fall Festival. The event features antiques and original crafts, performers, a pumpkin decorating contest, food court featuring local establishments, children’s obstacle course & games, and professional pony rides.